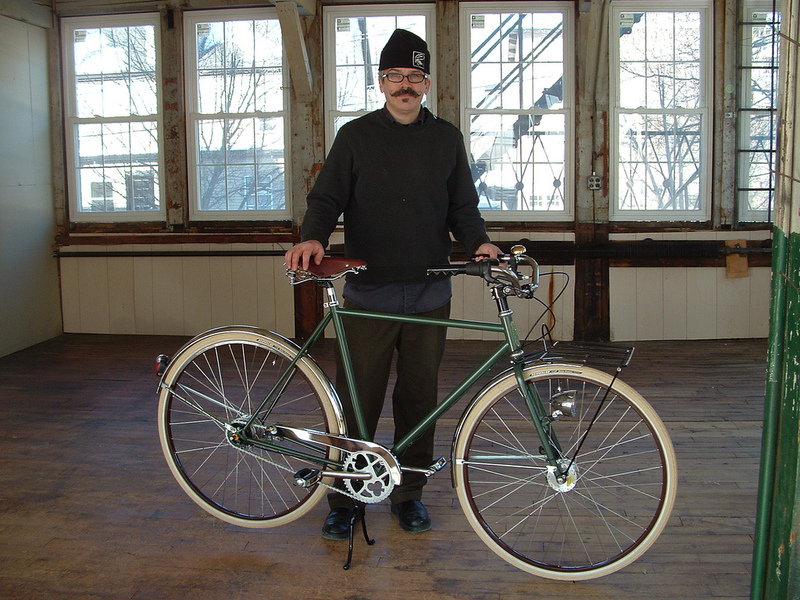 ANT Bike’s Mike Flanigan with a Boston Roadster. Photo via ANT Bike flickr. New England is a stronghold of American custom frame builders. Portland, OR may have more of them, but New Englanders have been at it longer. The U.S. custom frame building business traces its roots to the 1970s when Richard Sachs, Peter Weigle, and Ben Serotta learned the craft at Whitcomb Cycles in London. Of course, companies such as Schwinn and Huffy had been manufacturing bicycles in the U.S. for decades, but Sachs, Weigle and Serotta were among the first to bring the tailor-made style of bicycle building to the States. When they returned to New England in 1972, Weigle and Sachs started the short-lived Whitcomb USA. Serotta started Serotta Cycles. The three laid the foundation for many generations of builders to come in the region. Flash forward to the late 80s, Fat City Cycles was in full swing and a young Mike Flanigan rolled into Boston from Texas and talked his way into a job in the paint department. Over his five years there he became a master painter and found the time to teach himself TIG welding. When Fat City was sold in the mid-90s, Flanigan and a few other Fat City refugees started Independent Fabrication. In the early 2000s, dissatisfied with the direction of his company, he left and launched his one-man, city and cargo bike-focused shop, Alternative Needs Transportation (ANT). Between Fat City, Independent Fabrication, and ANT, Flanigan has played an important role in shaping the modern frame building landscape. He also played a part in bringing city bikes to the American mainstream. I spoke to Flanigan about his deep history in the frame building world, Fat City’s major influence, the value and significant of custom bikes, and his recent closure of ANT bikes.